The next big composer to embark upon a concert tour is Hans Zimmer, who is preparing to travel around Europe in spring of 2016 for a Hans Zimmer Live show. We all know Zimmer's music, his filmography is extensive ranging from Inception, Man of Steel and Spider-Man to The Rock, Gladiator and True Romance. He's touring with a full orchestra, a full band, and he'll be there himself, so this is one of those don't-miss shows if you're a fan of his scores. This teaser video below just shows a glimpse of some of the music being performed at another one-time live concert event in 2014 in London. But it makes me want to go see more. 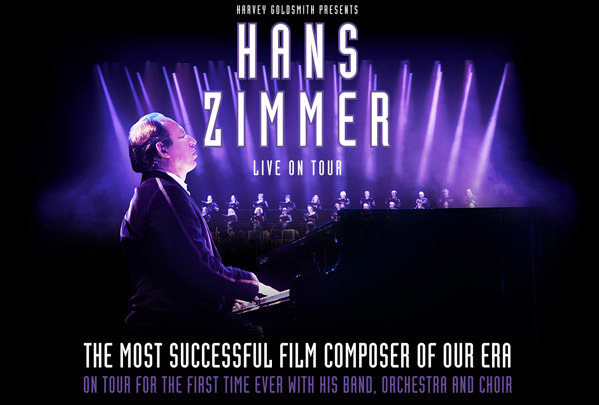 "Performing a tour like this is something that I have always wanted to do, and I am thrilled that the time has finally come," Hans Zimmer explains in a press release. "I am very excited to get some of my very talented friends together and give our audiences an experience unlike any concert they have ever been to before." The trailer video was produced by Harvey Goldsmith & Remote Control Productions. Zimmer's European concert series kicks off in London, England on April 6th, 2016 next spring. It tours around to 18 different European cities throughout Germany, France, Poland, Belgium, Hungary, Austria and Bulgaria. We hope he returns to the US for a tour. In the meantime, for more info and to find tickets - visit hanszimmerlive.com. I enjoy the guy's musical scores on screen but... really? People want to see the songs live, hearing film scores played live by an orchestra is amazing, better than hearing them in a movie theatre even. I saw him in 2014 in London and he was pretty epic. Started out with the tune from Driving Miss Daisy. As the score built in layers, so they revealed more of the orchestra and choir. He finished on Time from Inception which did the opposite and faded down to him solitarily playing the final piano chords of that great track. It was perfect and magical. One of the best performances that I've ever seen.